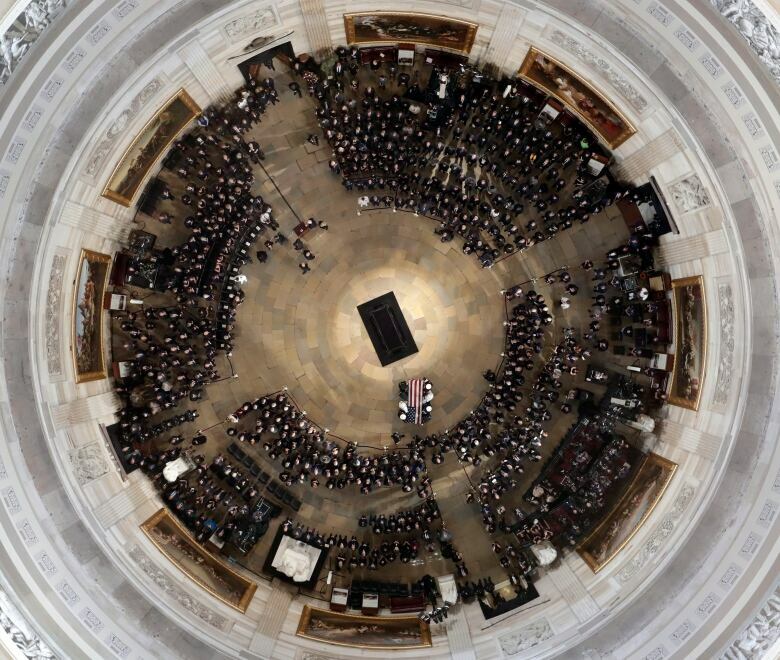 Family, friends, lawmakers and other guests, including some celebrities, are gathered in the rotunda at the U.S. Capitol, where the body of John McCain lies in state, for a memorial service to honour the six-term senator. 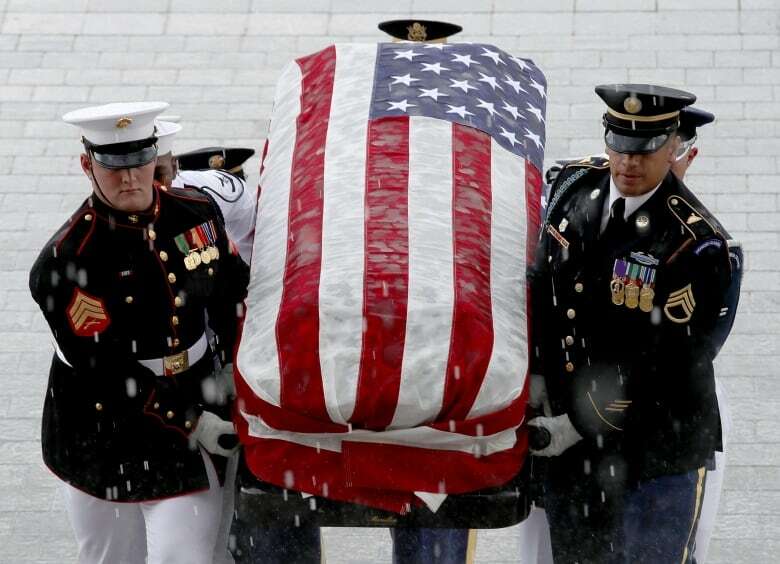 It was Washington's turn to say goodbye to John McCain on Friday. 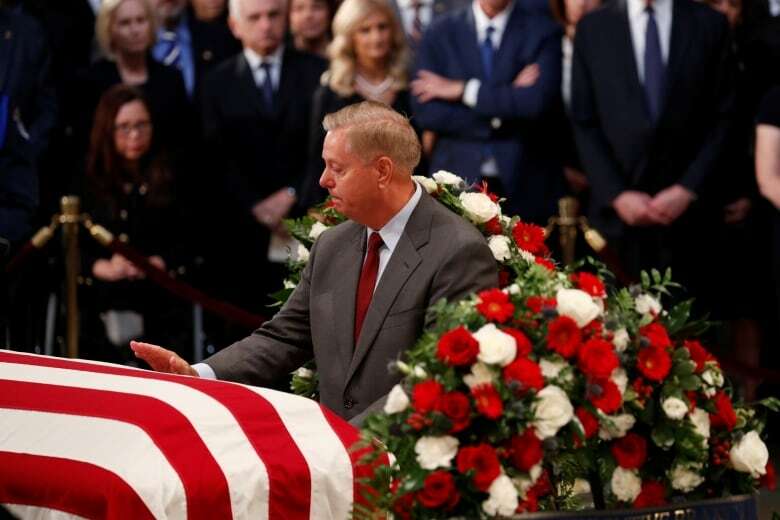 Family, friends, lawmakers and other guests, including some celebrities, gathered in the rotunda at the U.S. Capitol, where the body of John McCain lies in state, for a memorial service to honour the six-term senator who lived and worked in the nation's capital for over four decades. Congressional leaders and former colleagues delivered remarks at the memorial, led by Vice-President Mike Pence. "The president asked me to be here, on behalf of a grateful nation, to pay a debt of honour and respect ... and it's my great honour to be here," said Pence. 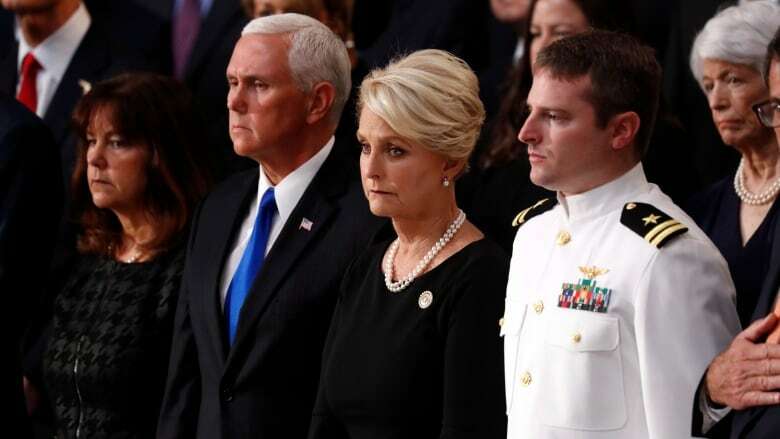 Before heading to their seats, Pence and his wife Karen said a few words to Roberta McCain, the senator's 106-year-old mother. 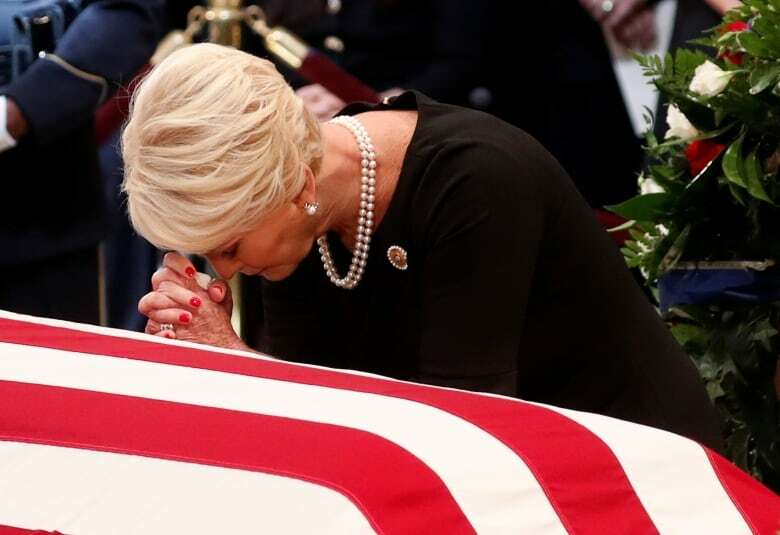 McCain's wife, Cindy, and other members of his family watched from the steps of the East Plaza as his casket was carried into the building earlier Friday. Senate Majority Leader Mitch McConnell was the first of the prominent speakers, praising McCain as someone who fought "tooth and nail for the common good." "He had America's fighting spirit, our noble idealism, our solemn patriotism, and our slightly irreverent streak — all rolled into one," said McConnell, a colleague of McCain's for 33 years in the Senate. House Speaker Paul Ryan called McCain "one of the bravest souls our nation has produced." McCain, a former Navy aviator, really did "talk like a sailor," Ryan said, drawing smiles from the crowd. "But you see, with John, it wasn't feigned disagreement. The man didn't feign anything. He just relished the fight." On Saturday, McCain's funeral procession will pause by the Vietnam Memorial before heading to the Washington National Cathedral for a formal funeral service. At McCain's request, two former presidents — Democrat Barack Obama and Republican George W. Bush — are expected to give eulogies. McCain's funeral puts him back in the spotlight a few miles from Trump's doorstep, in the city where the senator, who died last Saturday at 81, worked and collected friends and enemies — and some people were both at different times. The procession is expected to continue highlighting what McCain found important, some of which contrasts with Trump's style and priorities. The procession's pause at the Vietnam Veterans Memorial, where his wife is expected to lay a wreath, will highlight McCain's military service and his more than five years as a prisoner of war. The McCain farewell began Wednesday and Thursday in Arizona, where he and his wife raised their family. Former vice-president Joe Biden, a Democrat, and others provided a preview of the tributes to come. The service brought to a close two days of mourning for the U.S. senator and 2008 presidential nominee in his home state. At the end of the nearly 90-minute ceremony Thursday, McCain's casket was wheeled out of the church to My Way, in tribute to a politician known for following his own path. 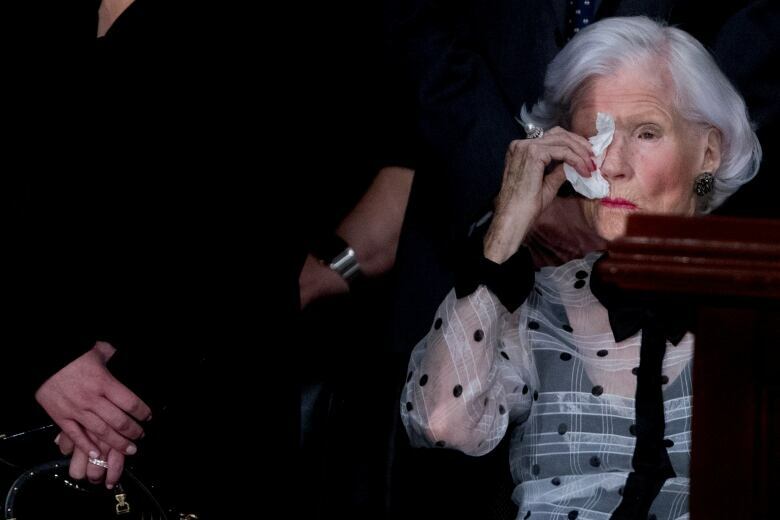 Defence Secretary James Mattis greeted the McCain family Thursday night when the late senator's casket was flown into Joint Base Andrews, Maryland.